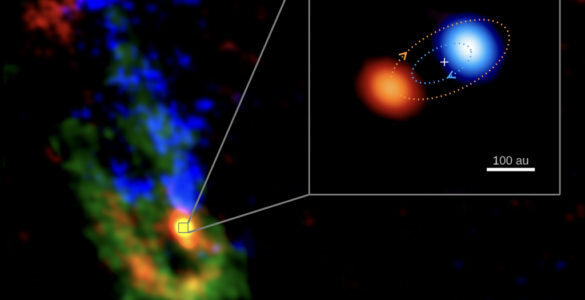 Three months of observations with the National Science Foundation’s Karl G. Jansky Very Large Array (VLA) have allowed astronomers to zero in on the most likely explanation for what happened in the aftermath of the violent collision of a pair of neutron stars in a galaxy 130 million light-years from Earth. 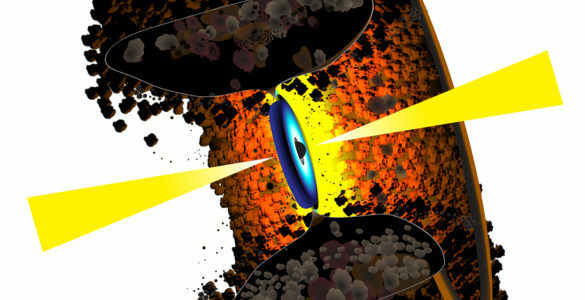 What they learned means that astronomers will be able to see and study many more such collisions. On August 17, 2017, the LIGO and VIRGO gravitational-wave observatories combined to locate the faint ripples in spacetime caused by the merger of two superdense neutron stars. It was the first confirmed detection of such a merger and only the fifth direct detection ever of gravitational waves, predicted more than a century ago by Albert Einstein. The gravitational waves were followed by outbursts of gamma rays, X-rays, and visible light from the event. The VLA detected the first radio waves coming from the event on September 2. This was the first time any astronomical object had been seen with both gravitational waves and electromagnetic waves. The timing and strength of the electromagnetic radiation at different wavelengths provided scientists with clues about the nature of the phenomena created by the initial neutron-star collision. Prior to the August event, theorists had proposed several ideas — theoretical models — about these phenomena. As the first such collision to be positively identified, the August event provided the first opportunity to compare predictions of the models to actual observations. Astronomers using the VLA, along with the Australia Telescope Compact Array and the Giant Metrewave Radio Telescope in India, regularly observed the object from September onward. The radio telescopes showed the radio emission steadily gaining strength. Based on this, the astronomers identified the most likely scenario for the merger’s aftermath. 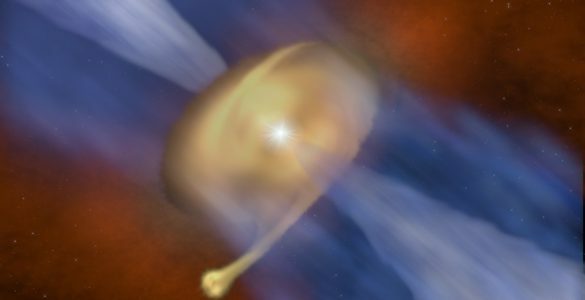 “The gradual brightening of the radio signal indicates we are seeing a wide-angle outflow of material, traveling at speeds comparable to the speed of light, from the neutron star merger,” said Kunal Mooley, now a National Radio Astronomy Observatory (NRAO) Jansky Postdoctoral Fellow hosted by Caltech. The observed measurements are helping the astronomers figure out the sequence of events triggered by the collision of the neutron stars. The initial merger of the two superdense objects caused an explosion, called a kilonova, that propelled a spherical shell of debris outward. 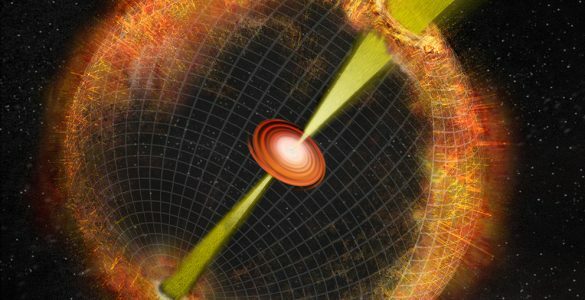 The neutron stars collapsed into a remnant, possibly a black hole, whose powerful gravity began pulling material toward it. That material formed a rapidly-spinning disk that generated a pair of narrow, superfast jets of material flowing outward from its poles. If one of the jets were pointed directly toward Earth, we would have seen a short-duration gamma-ray burst, like many seen before, the scientists said. “That clearly was not the case,” Mooley said. Some of the early measurements of the August event suggested instead that one of the jets may have been pointed slightly away from Earth. This model would explain the fact that the radio and X-ray emission were seen only some time after the collision. “That simple model — of a jet with no structure (a so-called top-hat jet) seen off-axis — would have the radio and X-ray emission slowly getting weaker. As we watched the radio emission strengthening, we realized that the explanation required a different model,” said Alessandra Corsi, of Texas Tech University. 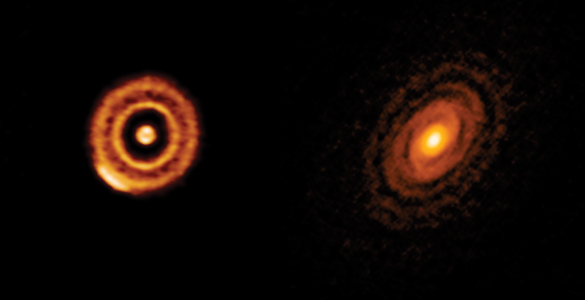 The astronomers looked to a model published in October by Mansi Kasliwal of Caltech, and colleagues, and further developed by Ore Gottlieb, of Tel Aviv University, and his colleagues. In that model, the jet does not make its way out of the sphere of explosion debris. Instead, it gathers up surrounding material as it moves outward, producing a broad “cocoon” that absorbs the jet’s energy. The astronomers favored this scenario based on the information they gathered from using the radio telescopes. Soon after the initial observations of the merger site, the Earth’s annual trip around the Sun placed the object too close to the Sun in the sky for X-ray and visible-light telescopes to observe. For weeks, the radio telescopes were the only way to continue gathering data about the event. 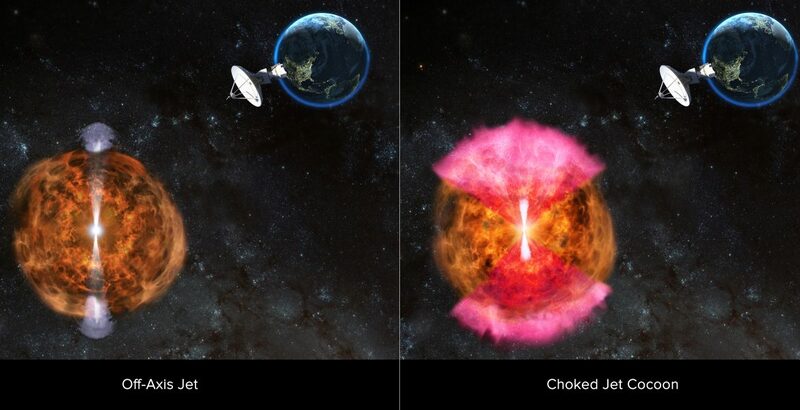 “If the radio waves and X-rays both are coming from an expanding cocoon, we realized that our radio measurements meant that, when NASA’s Chandra X-ray Observatory could observe once again, it would find the X-rays, like the radio waves, had increased in strength,” Corsi said. Mooley and his colleagues posted a paper with their radio measurements, their favored scenario for the event, and this prediction online on November 30. Chandra was scheduled to observe the object on December 2 and 6. “On December 7, the Chandra results came out, and the X-ray emission had brightened just as we predicted,” said Gregg Hallinan, of Caltech. “The agreement between the radio and X-ray data suggests that the X-rays are originating from the same outflow that’s producing the radio waves,” Mooley said. Mooley, Hallinan, Corsi, and their colleagues reported their findings in the scientific journal Nature. Different scenarios for the aftermath of the collision of two neutron stars. 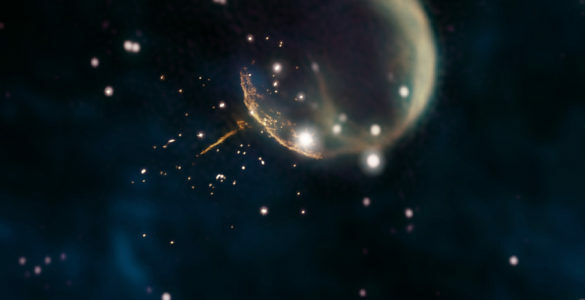 At left (in the short gamma-ray burst [SGRB] scenario), a jet of material moving at nearly the speed of light is propelled from the collision site into a sphere of material initially blown out by the resulting explosion. If viewed from an angle away (off-axis) from the center of the jet, the long-term emission of X-rays and radio waves would be getting weaker. At right, the jet cannot punch out of the shell of explosion debris, but instead sweeps up material into a broad "cocoon," which absorbs the jet's energy and emits X-rays and radio waves over a wider angle. In this case, such emission is still growing in intensity, as now observed with both radio and X-ray telescopes.